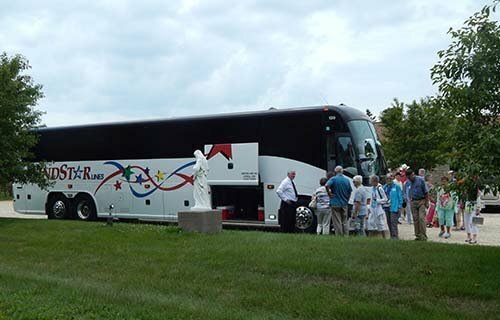 When it comes to group bus rentals, excellent tour operators are part of our DNA. After all, Windstar Lines was born of a successful group tour operator from the midwestern town of Carroll, Iowa. Our talented staff along with our reliable fleet and competitive pricing makes Windstar Lines the best choice for bank travel club bus rentals. For bank travel clubs, we understand that comfort, safety, and enjoyment are key. Let Windstar Lines show you how we outperform other companies in all of these areas and more! Budget: Are you simply looking for a comfortable ride without all the bells and whistles, or are you trying to impress your guests with VIP status? Size: How many guests are traveling? How much luggage will they have? How much space do they need? Duration: Is this a day trip to a local attraction or a two-week journey across the country? Will your guests need sleeping quarters on the bus? Not sure about what amenities are completely necessary or need more guidance to help choose the best transportation for your group? Check out our entire fleet for side-by-side comparison, or contact us, and one of our professionals would be glad to answer questions and help you plan accordingly! When you choose Windstar Lines for your bank club travel, you are leaving your customers in our hands, and we don’t take that lightly. Not only are our buses and motorcoaches maintained to strict safety standards, but we also ensure our driving staff are vetted and skillfully trained to operate our vehicles safely. When it comes to getting your bank club from point A to point B, safety comes first. Bank travel clubs present a unique opportunity for our drivers, as they are tasked with not only safely and comfortably transporting riders to their destination, but also acting as bus tour operators along the way. We handpick drivers specifically for bank travel clubs who will excel in enhancing the overall experience through their skilled driving ability and unmatched customer service skills. The drive can have an enormous impact on your bus tour, and with Windstar Lines, we understand that the littlest things can make the biggest difference.